I have fond memories of attending church services as a child, though it was a constant struggle for my parents to keep five kids quiet and non-disruptive. How do you keep kids focused in church? This was difficult. What child can get all their wiggles out and sit still for longer than a minute? However, my father had a great way of keeping us occupied on our pew bench. Every year for Christmas, Santa Claus would leave a cardboard “story book” full of rolls of Lifesaver candies in my father’s stocking. And every Sunday, we’d make our way to our self-designated church bench, hard and unyielding, in the back, right corner of the chapel. We knew we had to be good until after the Sacrament, otherwise we wouldn’t be able to get the rolls of candy my father put in his suit jacket pocket. But the rigid wood inflicting pain on our tailbones made it difficult to stay in one spot. After the Sacrament, he would pull them out of his pocket as we waited eagerly for what flavors would be dealt. He’d pull on the red tab at the top and we’d watch the casing fall away as candy after candy appeared. Red cherry, watermelon green, banana, orange, and even entire rolls dedicated to butterscotch (which were my least favorite but I ate them anyway). Instead of talking, standing up and sitting down repeatedly, making up songs under our breath, or mindlessly flipping through the hymn book, we paid great attention to those candies Dad was holding. And believe it or not, we would listen to little bits of the sermon as well. It may have been an attempt to keep minds focused on the prize at hand, so we’d be less focused on the discomfort we were feeling about our pew, but it worked. On the off days, when he no longer had those lifesavers, life was hard for us kids. We had nothing but the hard wood beneath our behinds, which soon became increasingly painful on the tail bone. Coincidentally, this is when the tantrums were the most frequent, when children needed to be taken out into the foyer for screaming, or crying too loudly. We couldn’t hear the Lord’s message, and neither could our parents, who took us outside of the chapel in shifts. Now, with my own children, we carry on the tradition of the story book Lifesavers on comfortable pew benches. But this is just an added bonus and no longer a necessity. Because with Born Again Pews, we don’t have to distract our children from the pain of wooden benches while expecting them to sit still. They love sitting on the well-cushioned pew benches. And so do we. 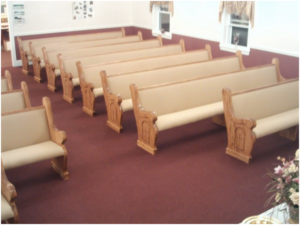 The wonderful owners of Born Again Pews desire to shine light upon others and minister to their brothers and sisters everywhere by providing beautiful solid oak pews and other church furniture, created specifically for the comfort of the congregation. Each pew is crafted and designed to meet the specific needs of individual chapels, providing a variety of fabric and cushion, so you can focus less on the physical and more on the sermon. They also offer personalized wood finishes to give churches furniture that enhances their chosen atmosphere. Serving church congregations is Born Again Pews’ way of serving God. Let them be your “lifesaver,” by providing your congregation the best possible church experience with their families. Born Again Pews loves to serve the Lord’s children with the best quality church furniture.